Rooftop solar PV systems have the capability to revolutionise the energy system in South Africa. The metropolitan municipalities alone have an economic rooftop installation potential of more than 11 GW for the residential sector, after taking rooftop restrictions into account. 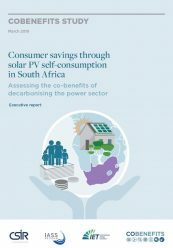 This study quantifies the expenditure savings that may be achieved by residential and commercial consumers in South Africa when installing rooftop solar photovoltaic (PV) systems with the aim of consuming most of the resulting electricity directly.